DIY KEY HOLDER FRAME – Never Lose Your Keys Again! Do you lose your keys? I do. All the time. The worst is when I’m in a hurry and my keys are M.I.A. I usually place my keys on the kitchen counter when I get home, but sometimes they don’t quite make it there. Sometimes I find them in my purse, or in my bedroom, or on the coffee table. But I have found my keys in some of the strangest places too, like in the refrigerator. Of course it’s never me who’s put them there. It’s those sneaky little key stealing fairies that sneak around when the lights go out. Anyway, after my most recent ‘where the heck are my keys’ episode, I decided it was time to get control of the situation. I had seen some key hanging ideas on Pinterest which inspired my own DIY key hanger picture frame. I loved my new chalkboard, and I especially loved how the frame came out with the gold color peaking through the turquoise. The thing is, I never used it. I thought it would be great for leaving notes or making lists. But in reality, I put it on a shelf and never touched it again. So when I was thinking about what I was going to do for my new key holder, this old frame came to mind. 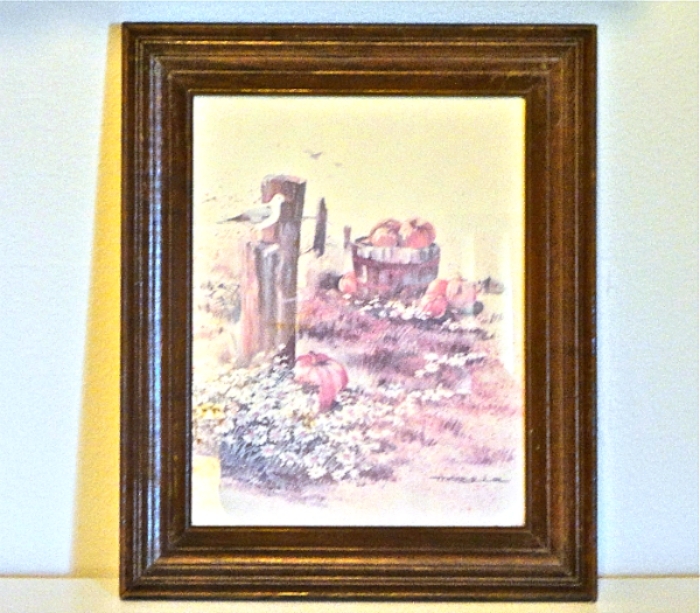 And as it turns out, the size of the frame is ideal for the small wall space next to the front door. So I figured it would be perfect to use for my new key holder. 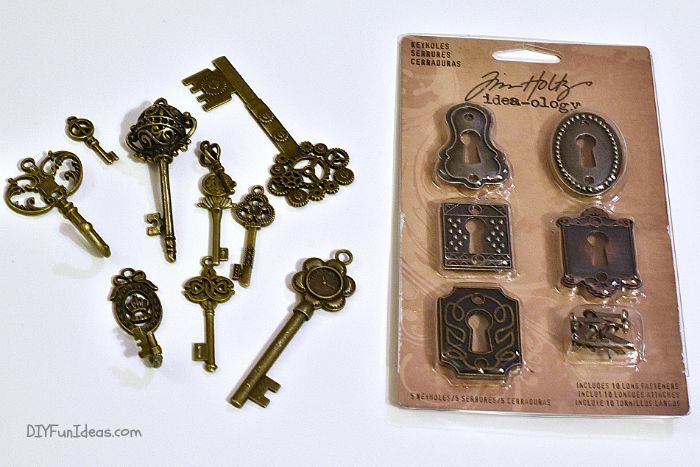 Next, I got online and found these really cool antique bronze looking skeleton keys and metal key holes. They were perfect for the vintage feel I was going for. Next I pulled out my box of craft supplies and mulled over my stash. I pulled out a bunch of different things, laid them out on the floor, decided I didn’t like it, put them away, repeated with different stuff. I went through this little process quite a few times until I landed on the combination of burlap, white lace ribbon, and a piece of poster board. It’s funny that after all the combinations of items I tried, it was the simplest combination that worked best. So my lesson here is don’t over think it. I bent a few of the keys so I could hang my real keys on them. Be careful bending the keys, though. I actually broke one when bending. But I crazy-glued it back together and it definitely won’t be breaking again any time soon. My new DIY key holder frame looks so cute hanging next to the front door. I’m totally loving it! I looked up a few chalkboard fonts online and found one I liked. Getting the letters perfect on the chalkboard can be a little challenging. After a few messed up tries I ended up using a small ruler to create a light graph with chalk. That made it way easier to get my letters straight and aligned. Then I used a few moist q-tips to erase the lines and any other imperfections. Now, the next two images are me trying to get creative as I learn to use my first ever DSLR camera. Honestly, I can’t tell if I like the blurred out backgrounds or if they just make me dizzy. Perhaps a little of each. That’s it folks! 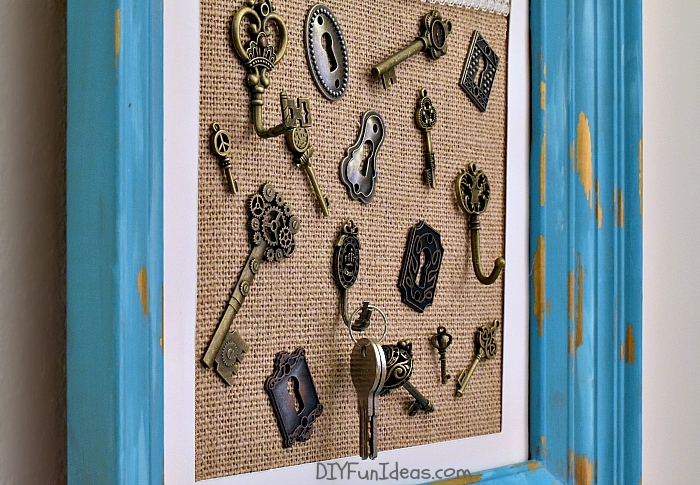 DIY key holder picture frame. Yay! 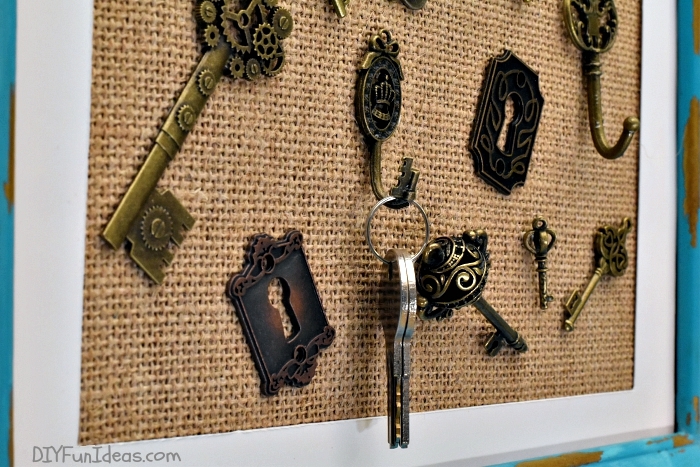 5 Comments on DIY KEY HOLDER FRAME – Never Lose Your Keys Again! Such a fun idea. I love the bent key hooks! The thing I love most about our year old car is that I just have to have the keys on me to start the car or unlock the door. That way I can just leave them in my purse. Once I touch the handle it unlocks. Heavenly!! Thanks for sharing with SYC. Jann, I love your car! I’ve had my car for over 10 years and I still love it, but I do love all the features of the new cars out there. I do tend to get very attached to my cars and drive them till the end. I had my previous car for 9 years that I drove when I was living in Utah and the salt (from all the snow removal) was starting to eat through the finish pretty badly. One day when my mom came to visit she was pretty horrified and embarrassed that I was driving that car. But I loved my old Subaru. She had to really fight me to go get a new one cause I still didn’t want to give it up. It was my first car that I bought all by myself and brand new after graduating college. She ended up dragging me to look at cars and I finally gave in. I can’t tell you how much I wish she was still able to drag me by the neck again. Thank you so much Pia! Excellent idea, thanks for your sharing!